For all of our frequently asked questions about the Me tab, check out this guide. The Me tab is your main shift information hub. This article outlines Frequently Asked Questions about this section. What is the 'Me tab'? The Me tab gives you an overview for your week. Here, you can see your shifts for the week, including worked and future shifts. You can also see the total number of hours worked for the week. You can also apply for leave and set unavailability via this page. Can we customise the date range shown in the Me tab? Unfortunately, the date range selector is limited to a 'Weekly' view. To change the displayed week, simply click on the date selector and select the week you would like to view. Our week starts on (x) day. Can we change the weekly start day? And will this show in the Me tab? The System Administrator can change the weekly start date from the Location Settings. 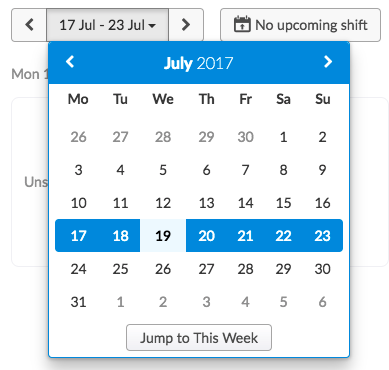 If this is changed, then the date selector will change to the altered weekly start day. The Me tab on the mobile application does not show a 7-day outline, so there is no date range to select. What is the weekly total? The Weekly Total will display the number of hours you are scheduled to work. But what if I have submitted some timesheets? The Weekly Total will add the submitted hours from the submitted timesheet to the total. In this example, adding a timesheet with 3h 17m is added to the 25.50 hours in the Weekly Total. Where do I set availability/unavailability/leave? To set unavailability, or to apply for leave, simply click the 'Request Time Off' button. Your profile will appear on the right side of the screen. Click 'Add New' for the corresponding leave type you would like to apply for. 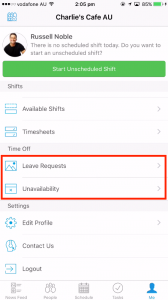 On the iOS app, simply tap 'Leave Requests' or 'Unavailability', depending on which one you would like to add. 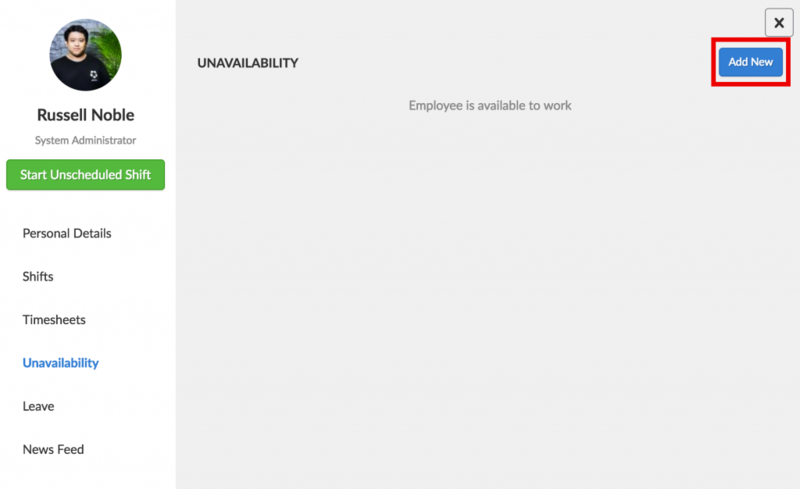 Applying for leave or setting unavailability on the Android app is similar to the other platforms. Simply tap 'Leave Requests' or 'Unavailability' and tap the '+' icon. Can other employees see who they are scheduled with? How do we restrict people from seeing others? The Me tab will show the other employees working for that day. To restrict this view, you will need to edit this option within Location Settings. To find this setting, head to the 'Scheduling' tab, then search for 'Allow employees to view each other's schedule'. How can I see more information about my shift in the Me tab? The easiest way to find out more about your shift is to head to the Me tab in the web product. From here, you can view and click and future shifts in the Calendar. Clicking the shift brings up additional information, including shift date, start and end times, allotted break length, area, location, and any shift notes. You can also quickly find a replacement via this pop-up.